It’s a classic case of corporate greed. Cosmetics companies want to save money so they replace natural exfoliants with plastic substitutes. Consumers unknowingly end up washing tiny plastic balls down the drain. They are too small for wastewater treatment plants to filter out, so they end up in our waterways, where they are consumed by fish. This is bad for the fish of course, since plastic is not their natural diet, but it’s also bad for those higher up on the food chain — larger fish, birds, and of course, humans. Luckily, there is an international campaign against microbeads, and in recent news, the state of California just banned them. 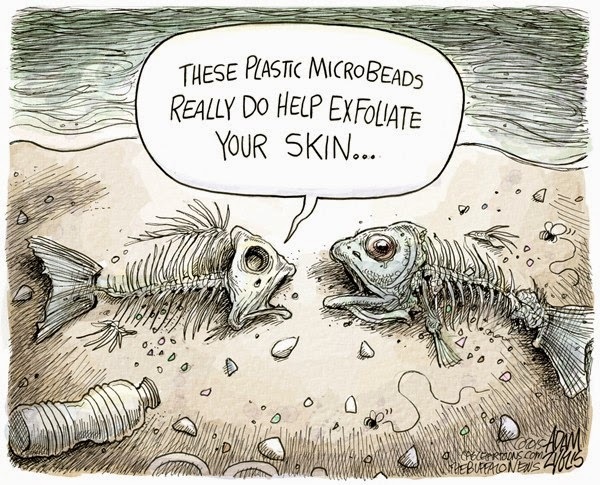 What you can do is avoid products that contain microbeads. Check the appropriate list for your country, and boycott away.